Saturday was another swingin’ day for exhibitors and attendees alike at Spectrum Miami. And with just one day left—the show wraps up at 5 p.m. today—artgoers and buyers have one last chance to head to the Arts and Entertainment District for an afternoon of stunning exhibits and Meet the Artist events. Check out this highlights video from yesterday. Philip Noyed’s “Rainbow Pyramid Light Experience” installation lights up the night. 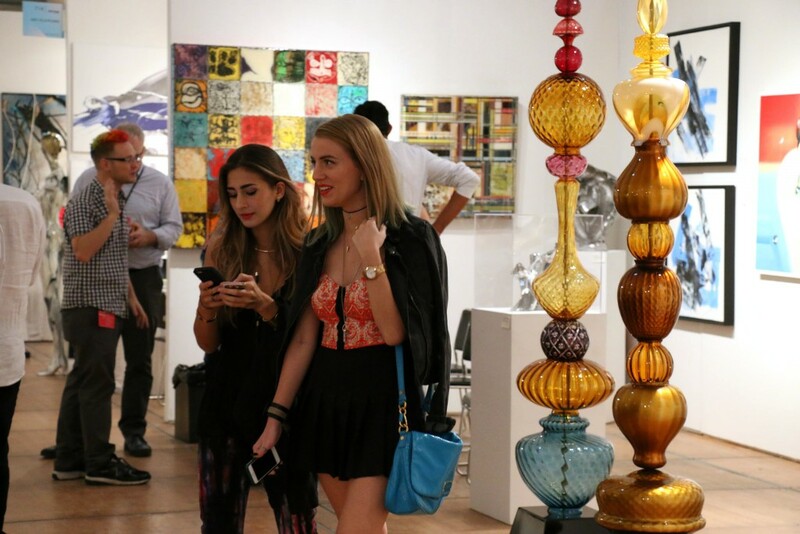 Sculpture, paintings, photography, and mixed-media art were on display at the 5th annual Spectrum Miami. Cocktails were stirred, hands were shaken, and plenty of good times were had by all on Saturday night as show attendees brought the party to Spectrum Miami’s tent. With our sponsor Absolut Elyx’s Water Truck Boutique refreshing our guests and Basel Fest’s wine and craft beer stations adding to the festivities at locations throughout the show, Spectrum attendees had plenty of drink options with which to toast this fabulous event. Inside the Absolut Elyx Water Truck Boutique. Attendees pose in front of the Spectrum tent. Taking a beverage break in between exploring the many booths. Today, make sure to catch the Help Hope Nepal mural wall in Booth 315, featuring artwork by hundreds of artists worldwide, as well as the Art Talk in Booth 110, during which you’ll hear from several ARTE Cuba artists on the inspiration behind their art. There are still plenty of live art demos going on today: Michael Alfano, sculptor of Cubed; tape artist Max Zorn; painter Kelly Fischer; and the artists of Art Design Consultants. Here’s a look at the complete schedule. Sculpture from Rubber Stamp Art Projects. Attendees take in the sights at the Work of Art Gallery booth. 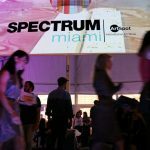 Don’t forget to use the hashtag #spectrummiami on your Instagram, Facebook, and Twitter posts from the show. We look forward to seeing you there today!